No other message that came from the Champions Classic Tuesday night could be anywhere near as shocking, or as awe-inspiring, or as hype-confirming, or as thoughts-of-March-provoking as that simple score. Duke 118, Kentucky 84. Worst loss of John Calipari’s Wildcat tenure. Felt like Alabama and Arkansas State. In football. Would you believe 60 Blue Devil points . . . in the paint? Or 43 field goals, 22 assists . . . and four turnovers? Or the freshman trio of RJ Barrett (33 points), Zion Williamson (28) and Cam Reddish (23) combining for 83 points . . . in other words coming within one point of the entire Kentucky team? Or being run out of the arena. With four top-10 teams in the house, with all those phenoms — when Duke met Kentucky, 10 players from ESPN’s top-30 for the recruiting class of 2018 were in the same game — we had to learn something, right? No. 1. Yeah, the Duke freshmen are that good. It ain’t going to be much fun trying to stop Mike Krzyzewski’s kids. Barrett, Williamson and Reddish took 53 shots and made 30 of them, or 57 percent. Fellow freshman Tre Jones ran things at point guard and had seven assists and no turnovers. Opening night jitters? What opening night jitters? That’d be scary. Krzyzewski looks at his offense rolling down the floor and sees a rare collection of weapons. The carnage was so total, Calipari stood in a second half Kentucky huddle and yearned for it to end soon. No. 2. Here’s more bad news for the non-Duke world. The Blue Devils are young, but might not play that way. Not even a heavily pro-Kentucky crowd – Indianapolis being highly drivable for Big Blue Nation – could faze them. The Wildcat throng that was thick on the sidewalks of downtown Indianapolis tried to whip up a frenzy in Bankers Life Fieldhouse. They even booed the kid in a Duke shirt on dance cam. Didn’t matter. No. 3. It will be absurdly early, but also very easy, to take Tuesday night and extrapolate to what Duke might do in March. Has any team ever gotten a No. 1 seed six days after Halloween? “If they play like that, they’re not losing many. 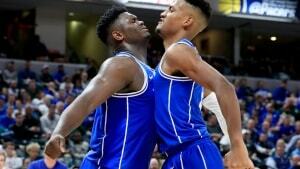 If that’s who they are,” Calipari said. Which is what should worry the rest of Division I today, from sea to shining sea. Is that who they are? No. 4. In one night, Kentucky went from No. 2 in the nation to facing this hard question — what now? Gee, those preseason games in the Bahamas had been so much fun. Calipari was most distressed by the four Duke turnovers, and mentioned that as an area requiring quick attention. The Kentucky faithful, easy to panic, were no doubt unsettled by the splattering. “They’ll watch this tape more than I’ll watch this tape,” Calipari said. Bottom line? “The most that you learn from this is they wanted it more than we wanted it. Then you look at it, and instead of coming together, we splintered and then guys tried to do their own thing,” Calipari said. No. 5. Oh, yeah. The No. 1 team in the nation also won, and it seemed clear that the new wave will keep things going in Lawrence, Kan.
Had the Duke rookies not been all-universe, it would have been easier to notice how freshman Quentin Grimes needed about nine minutes for his coming out party, hitting his first four shots as a Kansas Jayhawk, on his way to 21 points. Or how his roommate Devon Dotson, a blur of a guard, added 16 in the 92-87 win over Michigan State. Transfer Dedric Lawson went for 20 points and 14 rebounds, which means the three new faces in the Jayhawk lineup combined for 57 points. But a 7-footer should get more than three rebounds. No. 6. The Michigan State Spartans have some things to work on. A big one: Never again get beat to as many loose balls as they did in the first half against Kansas. Even former Michigan State star Steve Smith, visiting the locker room afterward, was not happy. Michigan State has now lost three in a row in the Champions Classic, the longest streak for any of the four teams in the eight-year history of the event. Izzo doesn’t mind, if his team learns something. “We will be better from playing this game, on this stage, in this tournament,” he said. Four teams came here to open the season, one team left looking ready for March. Someone at the press conference asked the Duke players about that, and Krzyzewski quickly interceded. The Blue Devils certainly had a grasp of November 6.